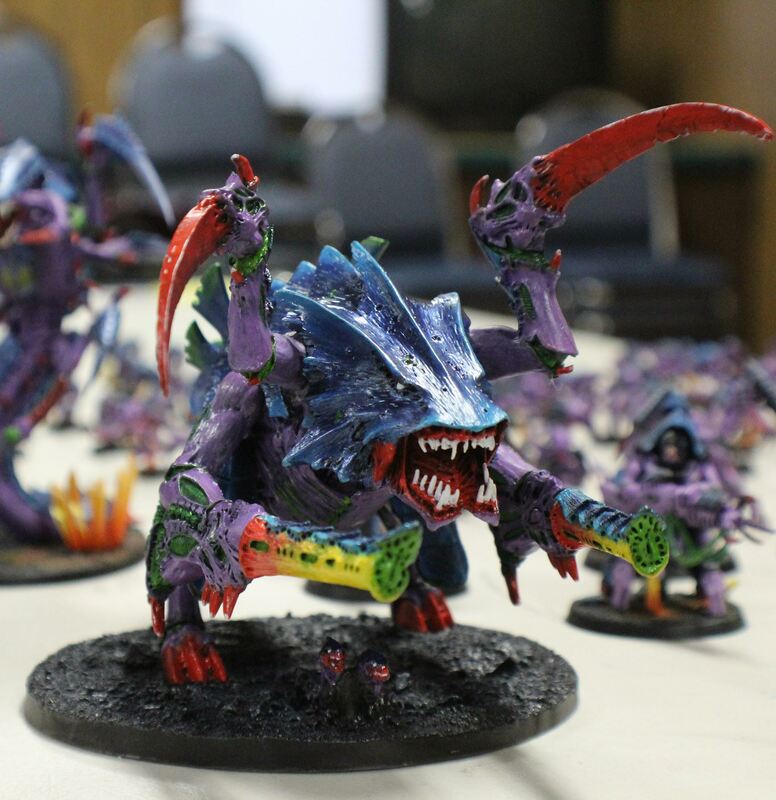 Alex sent in these snippets of lore to accompany the Crusade of Fire, his Salamanders army, which is operating in the Occulta Manticora Sub-Sector. 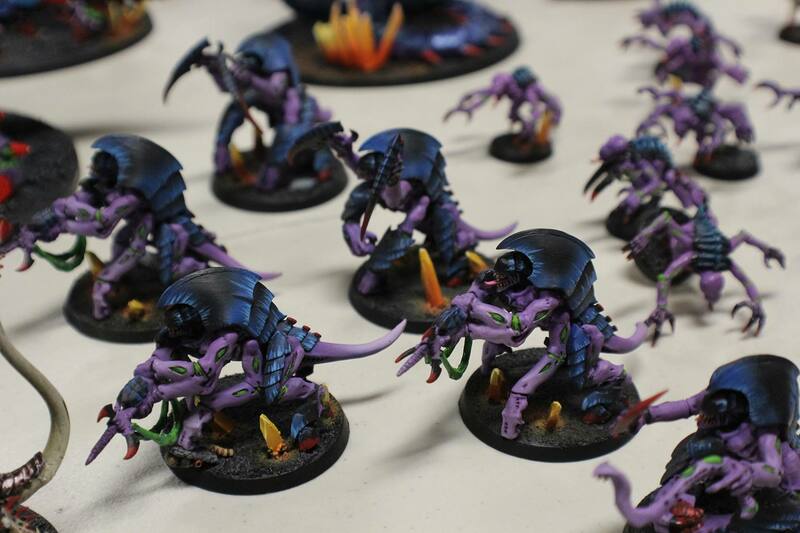 They’re interspersed with some photos of his newly completed Primaris Salamanders, too! Throughout the Caluphel system, an ancient and desperate call could be heard. Few could discern it from the background noise and fewer still could understand it. Destined to be lost to time and rot into eternity, the call was finally heard emanating from a deep space graveyard and a long forgotten citadel bearing the traitor’s mark. Around this once mighty station lay a field of broken and shattered vessels. Black, silver, and green shone from the pocked and rent hulls of the ancient craft. A battlefield fought not only in the void but also upon the massive decks of the fortress. An engagement that was a reminder of a time lost and a schism that mankind could never forget. The signal originated in the belly of an emerald and gold battle barge. In its hold, hastily constructed and hidden in desperation, was a secret compartment bearing precious cargo. Once the last line of defense for the vessel, but now the last survivors of an ancient cadre. Stranded in the void by the epic battle, on the outer reaches of man’s empire. Left with no other choice than to lie in slumber and to await their brothers. Ten thousand years later, their brothers would heed their call, and would find their battle barge. Arrayed within the vast chamber were row upon row of legionnaires of the great schism. Clad in the same heraldry of the ship they were found upon, and who undoubtedly would speak the same language as the one the message was transmitted in. In a rough semicircle they lay, held in place by stasis that sustained them at the very brink of death. And in the center of the room knelt a warrior clad in black; eternally facing a truly ancient sarcophagus and its mount. After ten thousand years, the sons of the XVIIIth would be reunited in a time of dire struggle for the Imperium of Man. The Salamanders of the Horus Heresy had been reborn. Chaplain Kryten was one of the few Terran-born warriors of the XVIIIth left after the battle of the Caldera and the unification if the Salamanders. Known for his cool demeanor and aggressive battle tactics even before his ascension into the chaplaincy, Kryten would go on to become one of the most effective and well respected chaplains in the Salamanders legion. He would accompany his legion to Istvaan V and survive the drop site massacre, leading a small battle group of survivors to regroup in the Eastern Fringe. However unbeknownst to him, the location he chose for his retreat was embroiled in its own part of the Horus Heresy. Upon arrival into the Cantoc (later renamed Occulta Manticora) Sub-Sector, his forces were immediately engaged by traitor forces as they attempted to dock at an orbiting starfort. Kryten’s intervention allowed the loyalists on the starfort to overload its primary plasma reactor and sabotage the station. Left crippled and drifting, the starfort proved to be a prison for Kryten and his men. The chaplain decided to put his surviving legionaries into stasis and broadcast a distress call only a Salamander could follow. Now awakened from his slumber ten thousand years later, he is ready to finish the crusade that he was never allowed to complete. Mortally wounded during a battle for an ork war moon during the unification of the Salamanders, Brother Nerus now interned inside a dreadnought sarcophagus to save his life. Clad in massive slabs of ceramite and adamantium, he would once again stride alongside his brothers into battle. With a temper unbound by his injuries, he would now hurl plasma bolts and missile barrages into the foes of the imperium once more. After his internment, he fought with his chapter until the massacre at Istvaan, where he would follow Chaplain Kryten to the Eastern Fringe. There he survived the engagement with the starfort and was put into hibernation to await the arrival of his late brethren. Once recovered, Ancient Nerus required many long hours of repair by by the Tech Adepts of Ryza and the few remaining Techmarines of the chapter to awaken the ancient pattern of sarcophagus. When he was finally coaxed out of his slumber, he awoke with the same wrath that he had possessed ten thousand years ago. Ready once again to fight the foul xenos and traitorous pigs that plague the Imperium. Bolter fire echoed through the outer wastes of Hive Eshtus. Whole buildings and men alike were vaporized by superheated plasma. The soil of Talnus was churned under foot by two clashing armies. 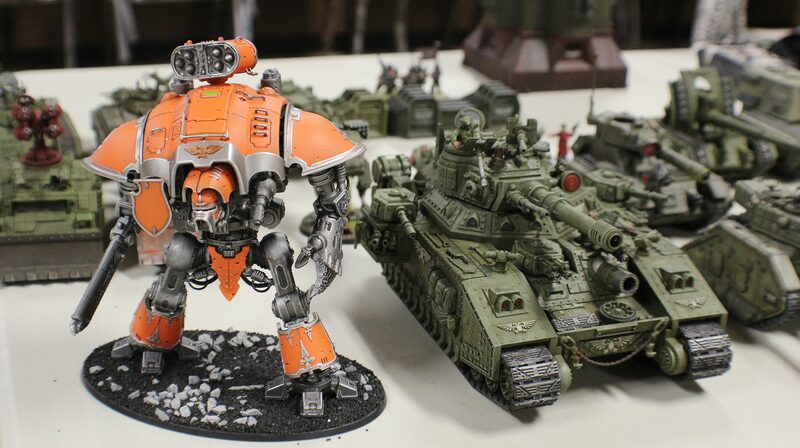 Mechanicus and Salamander forces held their ground against an ancient foe, fresh from the Heresy. 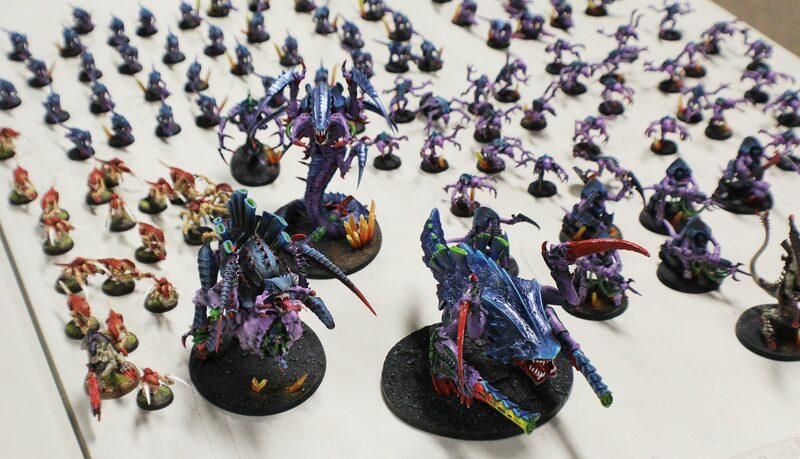 The great rift had split apart the Occulta Manticora system cluster had, due to the peculiarities of the warp, spat out a contingent of Heresy-era World Eaters several days prior. It was not long before the traitors would bypass the world’s defences and make planetfall. Hungry for blood in this strange yet familiar land, the sons of Angron would brutally assault the world only to be met by the Legion of Fire and its Mechanicus allies. At the center of it all was a small plateau in the center of the wastes. Resting upon it was was a decrepit Astra Militarum base where the majority of the Astartes forces would become concentrated. An ancient Spartan Assault Tank bore down upon a Land Raider five thousand years its junior; a Fire Raptor Gunship screamed overhead. The Space Marines clashed with a hatred old and bitter for some and yet new and ferocious for the others. Green met white and blue on that plateau with the detonation of mass reactive shells and the scorching of laser bolts. A wall of Terminators clashed, and gunships fell from the sky. Legionaries were mowed down by marines while a Leviathan Dreadnought would go supernova. In the end, the Crusade of Fire would emerge victorious over their traitorous kin, being forced to slay them to the last man, for their bloodthirst would not allow them to retreat. The Salamanders; however, were not unbloodied. In their struggle for victory, entire squads of battle brothers were lost and already scarce armour was destroyed. While the Mechanicus lost almost half a maniple to the World Eaters. But the day was won, and there was now one less threat for the Crusade of Fire to deal with as they prepared to march to Caluphel. Guardsman! Do not be fooled! Not every clean and non-spikey Space Marine is your friend. As you have been notified by you Commanding Officer, heretic Space Marines have made planetfall wearing armor similar to that worn by our very own holy protectors. To ease confusion and ensure better target acquisition rates, we have provided a simple checklist to help you determine friend from foe on the battlefield. If the subject checks any of these boxes, open fire on sight. Remember: a bloodthirsty, seven-and-a-half-foot tall killing machine will not wait for you to pull your manual out during combat, so memorize this list. Sub-Sector Eligaea encompasses the most direct route from Ultramar to Caluphel Prime. The coreward planets have long looked to Macragge or to Terra for protection. From this foundation, Warmaster Jedhansen’s Crusade pushes steadily outward to Caluphel. To the south is the Occulta Manticora Sub-Sector, under the protection of the noble Salamanders and their Crusade of Fire. Jedhansen will need their support for he faces enemies on two fronts. 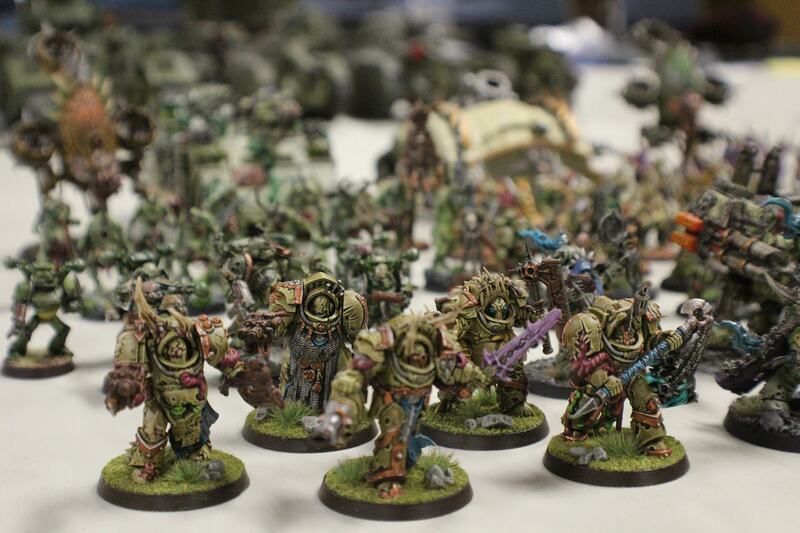 To the north is the Gluoroth Sub-Sector and the disastrous pillaging of the Death Guard. 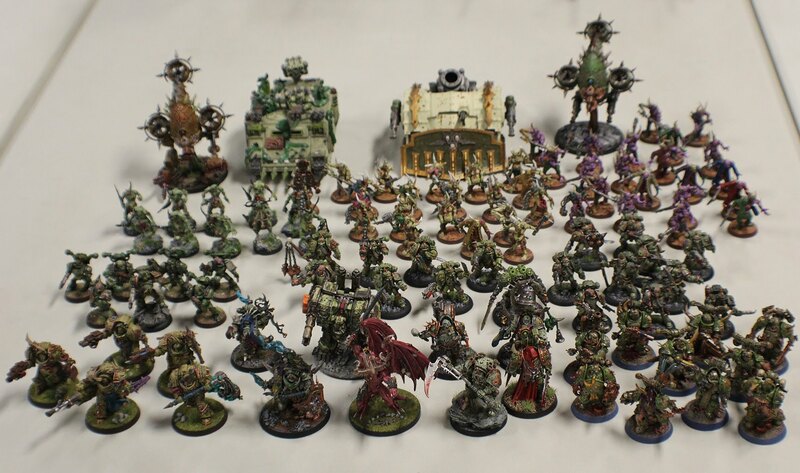 Directly between Jedhansen and Caluphel is the newly arisen Waaagh Zagstompa. Warboss Skullkrak has been uniting smaller Waaaghs under his banner and shows no sign of stopping. And while war unfolds on Purgatory and threatens Dicerge and Cantho, a slow moving fleet of Space Hulks drift towards Imperial Space… It is unclear if this is a machination of Skullkrak or some new enemy. Like the rest of the Imperium, Erigaea is a hot warzone. 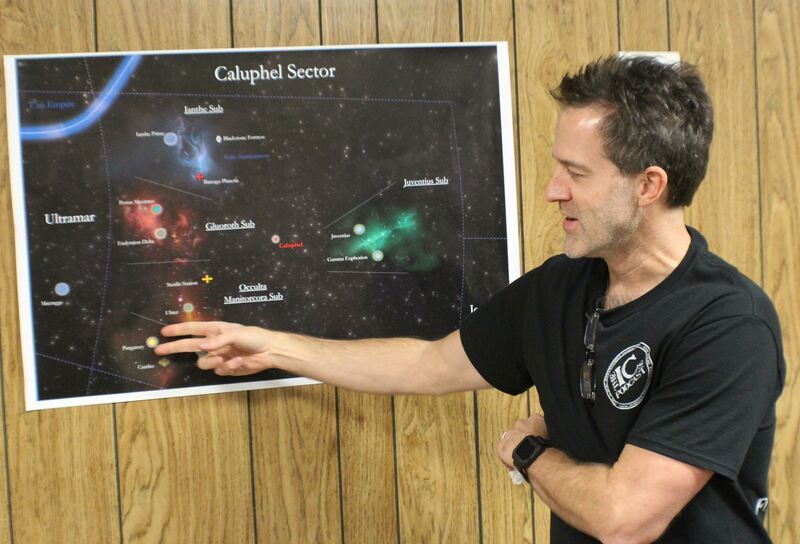 Jedhansen must reinforce what he has taken so far with his campaign, prevent further incursions of Death Guard and Orks, all while preventing the unfolding disaster on Caluphel. Hopefully the 42nd Auxiliary Armored Fist Battalion will turn the tide. Headquarters for Warmaster Jedhansen, Bereznato is actually the name of a supersized gas giant orbiting the system’s star. The gas giant has 15 habitable moons, all supporting hiveworld infrastructure. The moons are varied in environment, from agriculture dominant to troop-bearing population generators. Immense system defenses and regular Imperial Navy patrols have kept Bereznato free from Chaos incursions so far. An ccean world covered with scrubby archipelagos and island chains. 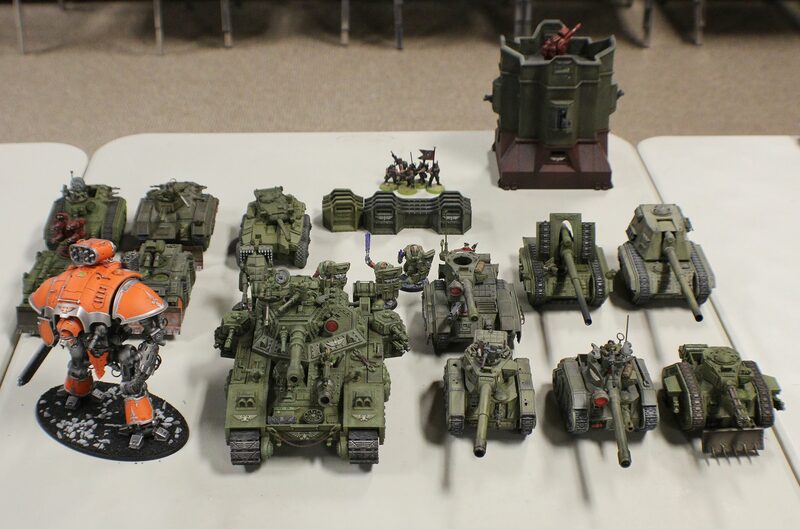 Imperial troops are arriving in force to reinforce the planet in preparation for Skullkrak’s Waaagh to cross the warp storm boundary. Natives who have fallen from compliance are waging a low-level guerrilla war against the Imperials, claiming desecration of their ocean. Homeworld for the 42nd Auxiliary Armored Fist Battalion. The Warmaster has entrusted the Caluphel thrust to the Armored Fist while he contends with the Waaagh. Cantho is a modern world set about with gothic medieval infrastructure and societal structures. However, the militant tradition of its aristrocracy is a perfect fit for the Armored Fist command. Fresh levies are being raised to ship out to Caluphel and brave the transit across the warp storm and the intervening Waaagh. Sooner or later, war will come to Cantho as well. Another ripe target for Skullkrak, Haistro is a tank forge world of the Mechanicum. Haistro’s factories are the engine behind the Armored Fist’s might. They are also a tempting target. A massive jungle world with dense flora structures, this planet generate a type of pollen that feed superfast growth of fungal life forms. 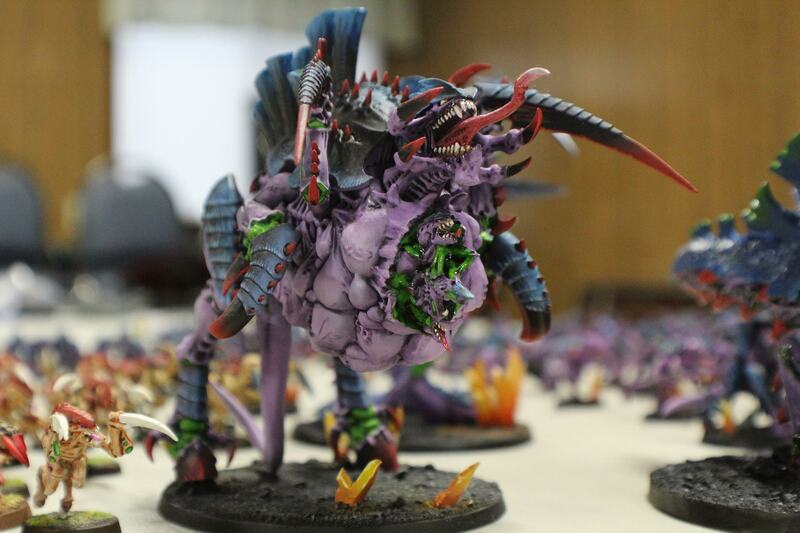 Coupled with fast-growing fauna monsters, it should not be surprising that a current Waaagh sprang from Protogo. Skullkrak was rumored to be a mere squib a few years ago, but has grown emormously in stature and inpower. His Waaagh has encapsulated other Waaaghs, repeatedly doubling and tripling in size into an unstoppable green wave. A desert planet sculpted by high winds that rip through red rock fissures and around massive super volcanoes. 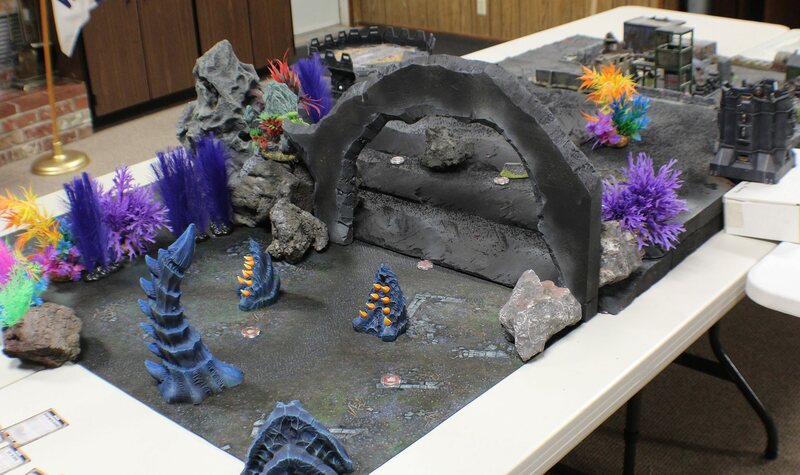 A desolate planetscape is seemingly designed to enable ambush warfare. 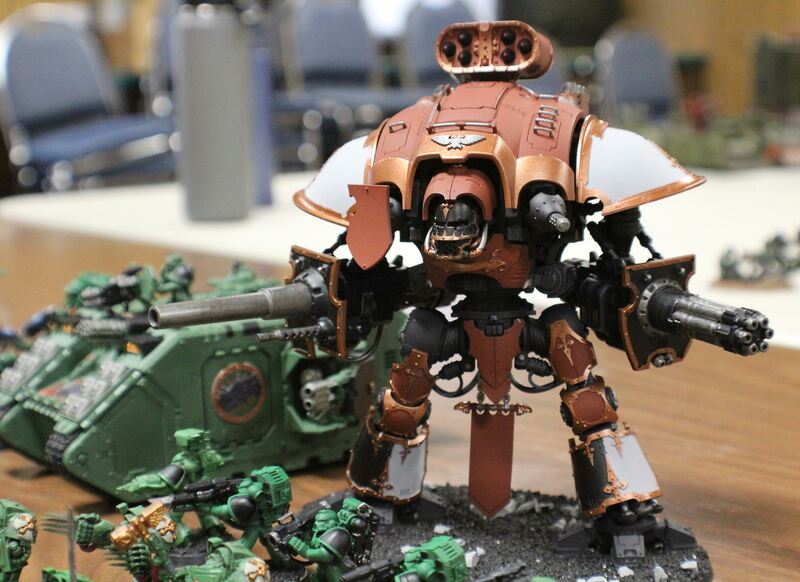 Skullkrak’s forces have apparently found ancient tech, or else Jedhansen would have ordered Exterminatus on the planet. Current world under fierce contention between the Warmaster and Skullkrak. Pergatory is a massive industrial planet, its hives devoted to tank and heavy armament production for the imperium. Much of the hive infrastructure lies in ruins after three years of solid war. A Forge World lost to the Dark Mechanicum. This volcanic planet is a choice target for the Crusade of Fire should they choose to move north. But the defending Titans of Minotaur may be too great a foe to tackle alone. 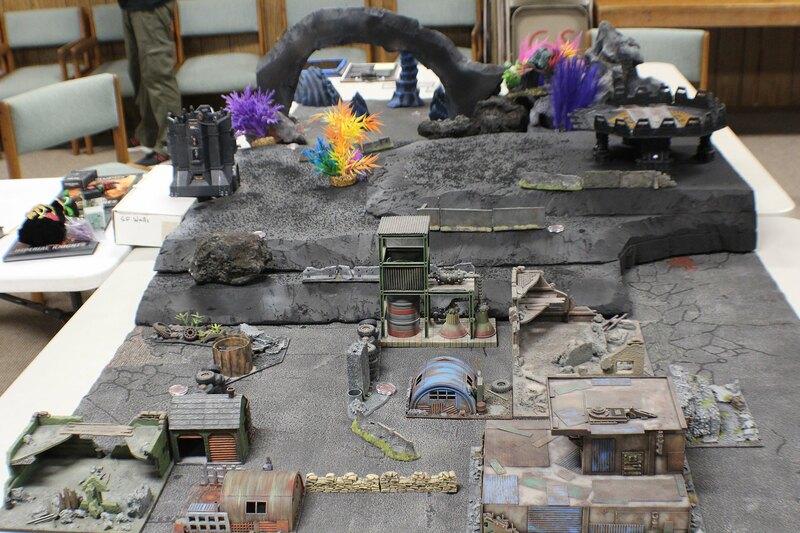 Rounding out the player contributions to our Warhammer 40k narrative campaign is the Ianthe Sub-Sector from Paul (our fearless campaign gamemaster). Paul is tugging on many, many puppet strings behind the scenes in the campaign, but he also found time to contribute his own custom sub-sector. 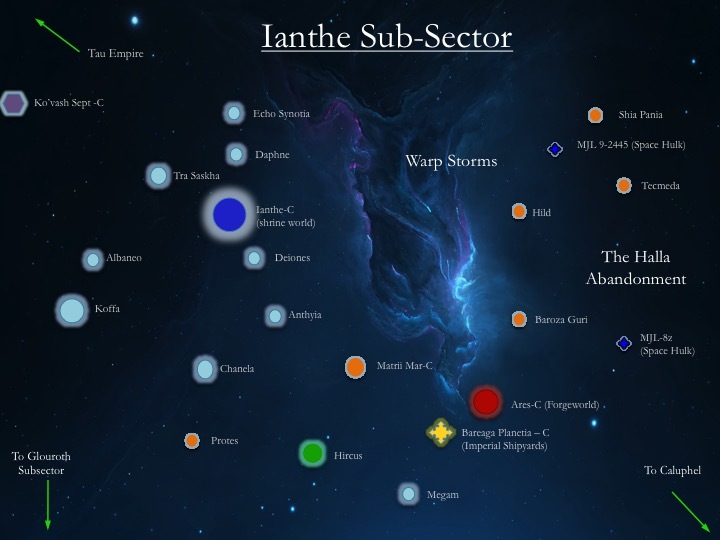 Behold, the Ianthe Sub-Sector!